Ready player one was my first. I wonder if that is why I prefer the mixed rl/game life books more than the trapped in the RPG books? RauthrMystic, Phalco1021, Felicity Weiss and 1 other person like this. I was thinking tonight of how LitRPG boiled down is basically portal fantasies like Chronicles of Narnia. We need a countdown page for the RPO movie! Heh. Also, mixed and trapped are two good ways to categorize books in the genre. oh man.... i needed that. lol where can I get one of those robes of the writer? nevermind the +4. I just need one of those robes for encouragement sake. Ready Player One was my first. Then I got sucked into the Way of the Shaman, Survival Quest, Awaken Online, and the Gam3 series. RauthrMystic, Paul Bellow and Jason like this. I had forgotten about Ready Player One, yeah that was before even End Online for me. Good stuff. Hopefully Dakota Krout will show up here at the forum. Guardians of the Flame series, the sleeping dragon. Bought it when it first got published. Yeah, I did a post on it. Good stuff. Um Huh. Soooooooo, not really the tag-in for a shifter PNR? Interestingly, a podcast review was removed from one of my books. I think they might be on to him! Otherworld was the first I read, back when it actually came out. So around the last century? I also had my first exposure to LitRPG with Guardian of the Flames, but I think after that it was random stand-alone webcomics featuring temporary RPG plotlines (Megatokyo (Endgames Universe), GU Comics, Penny Arcade) and then fan comics for MMOs (Destiny Dreamers ffxi, wtfcomics eq, Reflex eq) and finally a translated version of Yureka! / iD_eNTITY which really beat Legendary Moonlight Sculptor to the punch. But all the comics don't cover the "Lit" portion of LitRPG, but don't tell that to comic writers. I read the LMS translations but lost track of the series as translations (and translators) fell off in quality, and piecing together the story from Google Translations was a self-intervention moment: because the thought "Maybe I should learn Korean to read this..." crossed my mind. Which was a sort of "Maybe I should take a break from hoovering the internet" revelation for me. Probably my favorite examples of Game stories so far are mashups of roleplaying with in-game screenshots, Fansy the famous bard and Swamp Defense, pretty much every WoW forum had a collection of picture stories for cross faction trolling. Though I honestly regret my more jerkish endeavors in contributing to the form. But that filled the LitRPG itch for a few years, then TV miraculously became not crap and it felt like every day something geared exactly towards an audience of nerds that liked Soap Opera level drama was coming out. Now RPO and Jumanji (reboot) are coming out... and stuff geared exactly towards LitRPG fans might soon be on TV. I know I'm late to the party but Eden Redd in all of her smutastic beauty and exciting storytelling. My first was Alterworld. My mind was blown when I saw someone wrote a book based on playing game. It was one of those, Why didn't I think of that! RauthrMystic, WildAzazel, Paul Bellow and 1 other person like this. Viergacht and Readsalot like this. It may seem strange but I found my way into this fantastic mess thanks to The Slime Dungeon audiobooks. Kinda took over my kindle tablet and Ipod from there with sooooo many others! 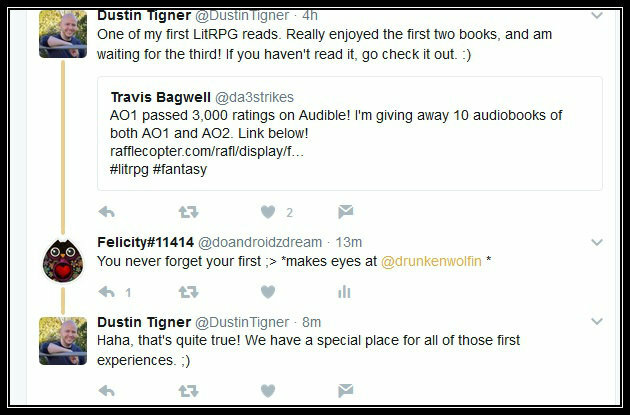 I still remember how shocked I was at discovering Dungeon POV was a thing and found the term LitRPG whilst browsing the 'Also Purchased' section.